Eighteen EMCC students competed in 15 events (some individual, some team) and placed in 13 of those events. 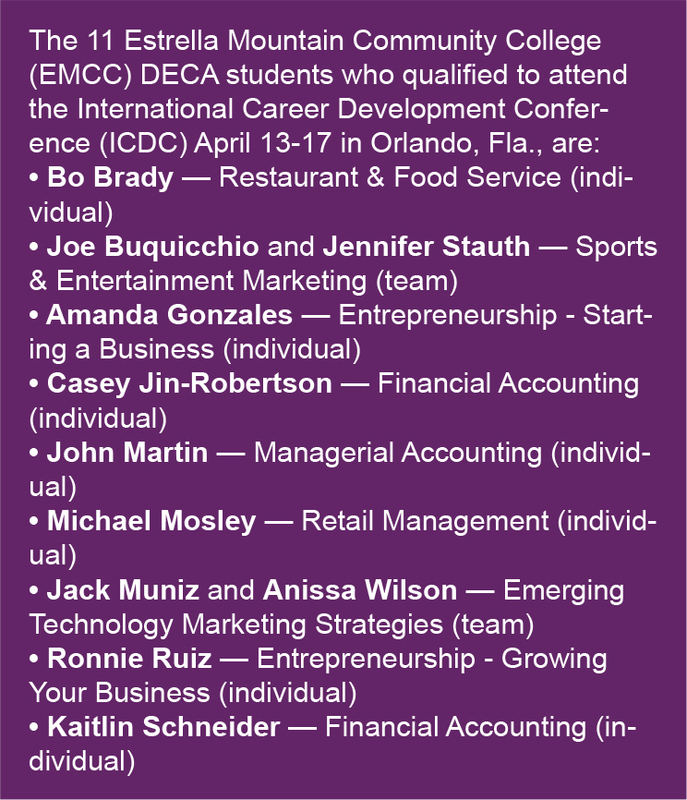 Eleven students placed in nine events that qualified for the International Career Development Conference (ICDC) set for April 13-17 in Orlando, Fla.
DECA prepares emerging leaders and entrepreneurs for careers in marketing, finance, hospitality and management in high schools and colleges around the globe. Founded in 1946, DECA has more than 15,000 members in its 275 college and university chapters and 200,000 members in its 3,500 high school chapters. Chapters are located in all 50 states, as well as the District of Columbia, Canada, China, Germany, Guam, Mexico, Puerto Rico, and Spain. Event categories at ACDC included accounting/finance, entrepreneurship, hospitality, marketing, and management. Students were able to compete in individual, team, or prepared events. Individual events involved a 100-question exam prior to the conference, and then competitors were given 30 minutes to analyze, solve, and prepare a presentation of a case study/role play. Team events, which were exempt from the exam, allowed competitors 60 minutes to prepare their presentations. Students who competed in prepared events were required to submit a 10- to 15-page business plan the first day of the conference and then explain and promote their business ideas. EMCC DECA Club President Michael Mosley said conferences such as ACDC benefit DECA students by giving them the chance to meet new people, network, and test their skills and knowledge. Mosley, who competed in the Retail Management individual event and qualified for ICDC, said he is looking forward to attending the conference in April. Students who attend ICDC attend an opening ceremony and workshops on Day 1; compete on Day 2; and if they make it to the second round, compete on Days 3 and 4. They also team up on one of two events — the Entrepreneurial Challenge or the Sales Challenge — where they are given a case study/role play and present their findings to a panel of judges. “It’s an activity-packed, four-day conference,” Ong said. Mosley, who began his EMCC journey in 2015 after a 20-year break, will graduate at the end of this semester and then transfer to San Diego State University (SDSU) where he plans on opening a DECA chapter. “I want to be able to continue competing and spreading the benefits of DECA,” he said. Ong credits Mosley with quadrupling EMCC’s DECA club membership this year. That increase, from five to 21 members, helped the EMCC club win the Chapter of the Year award at ACDC. The award comes with a $250 endowment. Ong said Mosley coordinates with other club officers/members who make classroom announcements in all of their classes; create and operate fundraising events; and actively participate and collaborate with other student clubs across campus, such as Student Government, STEM/Maker-Space Club, and Phi Theta Kappa (PTK). “Michael has been the face of our student club for the last two years and he took it upon himself to promote this club to all EMCC students across the campus,” Ong said. 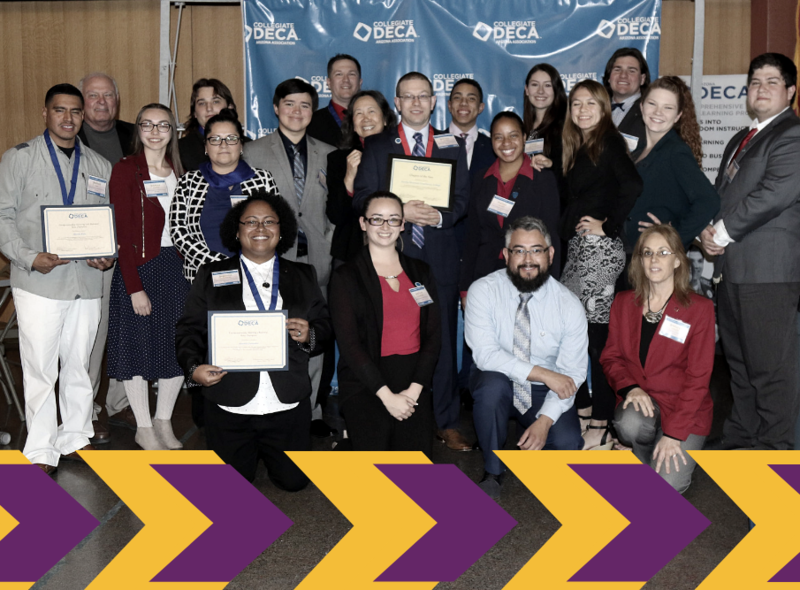 EMCC’s DECA chapter is part of the Entrepreneur/DECA Club, which meets from 1 to 2:30 p.m. the first and third Tuesday of the month in Ocotillo 120. The Entrepreneur side of the club invites guests to speak on such topics as how to start/expand, finance, and manage a business. The DECA side involves academic competitions. To learn more about EMCC’s Entrepreneur/DECA Club, visit https://www.estrellamountain.edu/institutes/business-institute/entrepreneur-deca-club.